This morning, I woke up feeling sick, with a runny nose and a lump in my throat. The moment I try to swallow, I realize, I have a sore throat. Damn, I really do not like this, as normally this condition indicates an onset of flu and fever. So I went "googling", in search of the cause of my sore throat, and how to cure it fast. 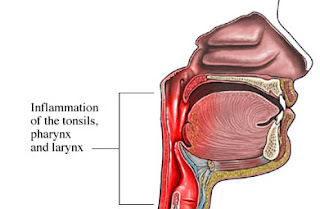 Found this picture below which kind of looks like my throat now I guess. Did you know the medical term for sore throats is pharyngitis? I didn't know that till I googled about it. Now you know why Google should be everyone's best friend. 1. Common viruses (that should be common knowledge ain't it), the viruses that causes the flu can cause sore throat. 3. Bacterias, the two most common bacteria to cause a sore throat are Streptococcus and Arcanobacterium haemolyticum. I think for my case it would most probably be the flu virus. Not too sure though since I'm not a doctor. Next up will be to try to find a quick fix for my sore throat. Did you know on the internet there are 1001 remedies for sore throat? From gargling with salt to swallowing red hot chillies. Below are some remedies which I plan to practise soon, namely the salt. 1. Salt water gargle, sprays and lozenges can provide temporary pain relief. 2. A humidifier may be helpful in relieving symptoms, especially in sore throats caused by mouth breathing and dry air. Well, that's that for now, need to rush off for my movie date (Tron) at 11.20am TGV Wangsa Walk. Happy New Year 2011 !! Sunday.. A day of rest.